All of us love celebrities, don’t we? The glitz, glamour, lights, camera, and makeup! We try to get to know them better and sometimes even emulate them. But there’s one day in all of our lives when we truly get to be stars – Our wedding day. 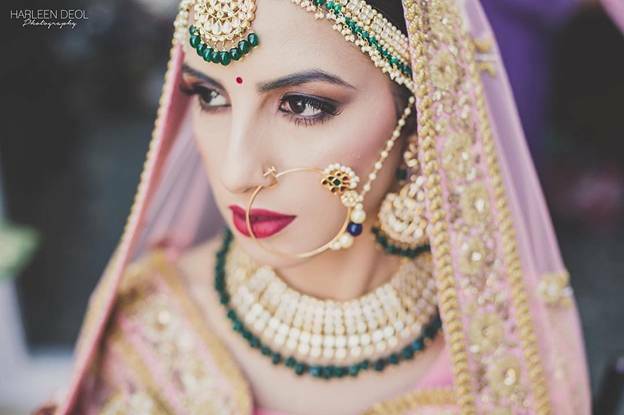 To make sure we look and FEEL our best on this special occasion, we need the best bridal makeup artist who can enhance our beauty naturally and a cool wedding photographer to capture it. And, also there are some things we need to keep in mind to protect our skin before the wedding. CTM Routine with weekly exfoliation – Sounds pretty basic but a regular cleansing, toning and moisturizing routine goes a long way in keeping our skin look fresh and hydrated. In addition to this, we ought to get rid of dead skin with a weekly scrub ritual. A tried and tested one is using kachhihaldi (turmeric), yogurt and besan (gram flour). Sun protection– Indians get exposed to a lot of sunlight and we need protection from ultraviolet rays. Hence, invest in a good sunscreen that has atleast SPF 30 and PA+++. La Shield and Kama Ayurveda have some good ones. Remember to stay out of the sun as much as possible while going shopping or visiting wedding vendors. Be Food wise – Never, ever skip meals. The stress of wedding planning can take a toll on your health so it’s doubly important to have a healthy diet. This includes lots of fruits and green veggies. Crash diets extremely close to the wedding date are a complete no-no. Instead try Apps like Healthifyme and MyFitnessPal that enable you to keep a track of the food and calories you are consuming and alert you whenever you need to cut down. Water – This little habit of drinking 8 glasses of water everyday seems inconsequential; but trust us when we say- it is completely worth it. Sleep – Late night calls with the fiancé are important of course, however we must try to manage our time in such a way that we get 6-8 hours of sound sleep. This ensures that our body and skin have time to rest and heal. Also lesser dark circles and puffy eyes. Fitness Apps–7 minute workout by Perigree, Yogastudio and Fitocracy make working out so much fun. They help you achieve your fitness goal before the nuptials. Other great options are aerial silk, zumba and aerobics classes to stay fit. Be consistent with salon appointments – Clean ups for the face and body massages / body polishing can be started 4 months in advance. For removing unwanted hair there’s waxing, threading and bleaching. Your last appointment should ideally be 3-4 days before the big day. New products – It is not advisable to experiment with new skincare / makeup or facials very close to your wedding. Stick to the ones you know will suit your skin. Don’t forget your hair and nails – Hair spas, manicures and pedicures not only help your hair and nails but are also a welcome break from all the running around that’s usually associated with the big fat Indian shaadi. Dermatologist / Laser hair removal, Teeth Whitening etc – Lastly, if you’re planning on clinical treatments (lasik surgery, skin treatments, laser etc) make sure you consult an expert well in advance. Some of these procedures require more than one sitting. And the most important bit is to spend quality time with your friends and family. Because a happy and content bride is a beautiful bride.